The Golden Cross to Honiley Court Hotel. See further down the page for previous years runs. Alan and the team arranged a great day for us, how do they manage to get the sun to shine on the days we are out? A super run in the sunshine from the Golden Cross to Kings Court in Coughton. There were 40 of us meandering through the lanes, well until someone pulled in at the side of the road and of course the rest of us following pulled in as well. There was lots of head scratching, with the bonnet up and Lech grovelling on the floor but it was finally decided it was lack of fuel. Fortunately Graham had a fuel container in his boot but with not much in. This was put into the car but it still wouldn't start, so not enough. Steve was sent of to the nearby TESCO to get a full can and we pushed the car up the hill into a vacant bus layby to wait. This second fill up did the trick and off we all went, although the MGC went to TESCO to fill up to avoid a reoccurrence!!! Everyone was waiting for lunch to be served but it was well worth the wait. Spring Run 2015 . . .
On March 29th Alan and Julia Cleobury, with the help of friends Steve, Gaynor, Jane and Mike, put together another of their excellent Spring Lunchtime runs. The weather was distinctly threatening. Those with modern MGs were happy to turn out in them, but others came in ordinary cars. Except for Doug!! What a hero. He steadfastly refused to put the roof up on his B roadster, despite some really heavy rain. There was an enjoyable run through three counties put together by the team, followed by a good lunch at the Honiley Court Hotel. Instead of a quiz, the team had come up with a great game where you had to guess the contents of several sealed bags. There was something of an automotive theme, and there was speculation that Alan was going to need to put all the bits back on his car to get it roadworthy again. The prize for this game was won by Dave and Alison ASmith, and, because of the weather, there was a prize for the "dirtiest car after the run" . . . but there was unanimous approval for this to go to Doug for having the "wettest interior after the run". A really great day - good fun and good friends. What a fantastic day we had, with the sun beating down all day. Many thanks to Mike & Jane for the scenic run over roads we have not travelled down before, I hope Mike have recovered from the argument with the chair after the presentations after lunch. Wroxall Abbey did us proud with our own dining room and sole use of the Courtyard to park up our cars for the photo shoot (look out for the photo on the Heritage Run Rally Plate & Front Cover). It was a nice touch from Alan bringing round the After Eight mints (even though it was not 2pm) after lunch to enjoy with the coffee. 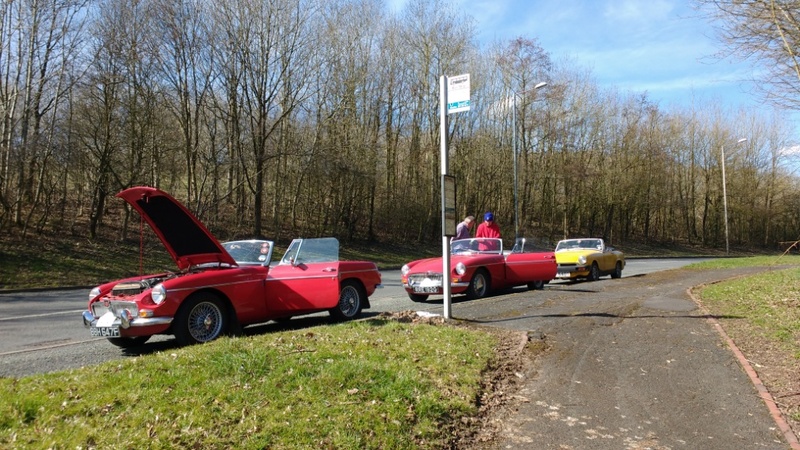 A & J's Sunday Lunch Run went very well, helped by the nice sunny day but mainly because of the excellent run and good venues on route. 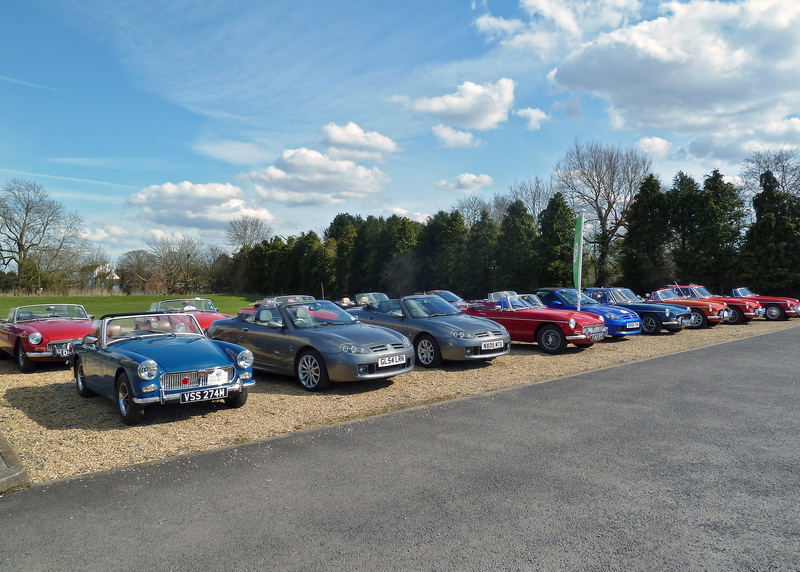 The coffee stop was at the Cotswold Farm Park and we had a good row of MGs lined up, with lots of interest from Park visitors. The final destination was the College Arms in Lower Quinton where a good lunch was enjoyed. There was also a fun quiz to keep the brains active. Thanks to Alan & Julia for organising a great event. The consensus of the meeting was that we should hold another Lunch Run - lets hope A&J will organise it, unless you want to have a try.